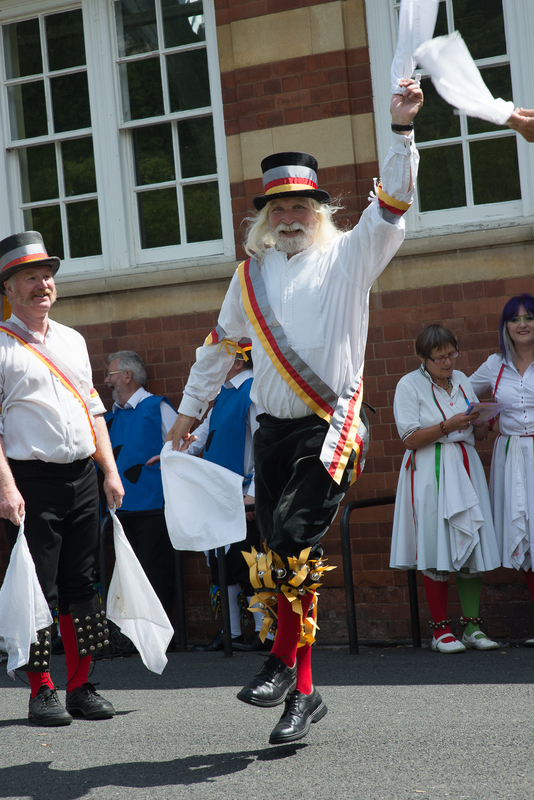 Malvern, Worcestershire 7/4/15 Leaping Morris Dancer. 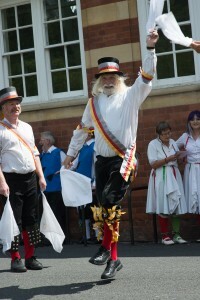 I’ve just posted a gallery of pictures taken of English Country Dancers taken last weekend. Enjoy! Years ago, one May Day morning, I walked past Holyoke Center on my way to the Harvard Square subway stop. A group dressed in white with ribbons on their arms and bells tied to their calves whilst carrying cudgels were dancing in the sterile plaza. The music accompanying these straggley Morris dancers made no impression on me. The dancing seemed dull. Seeing a bit more, every so often at the Christmas Revels, didn’t do much for me. 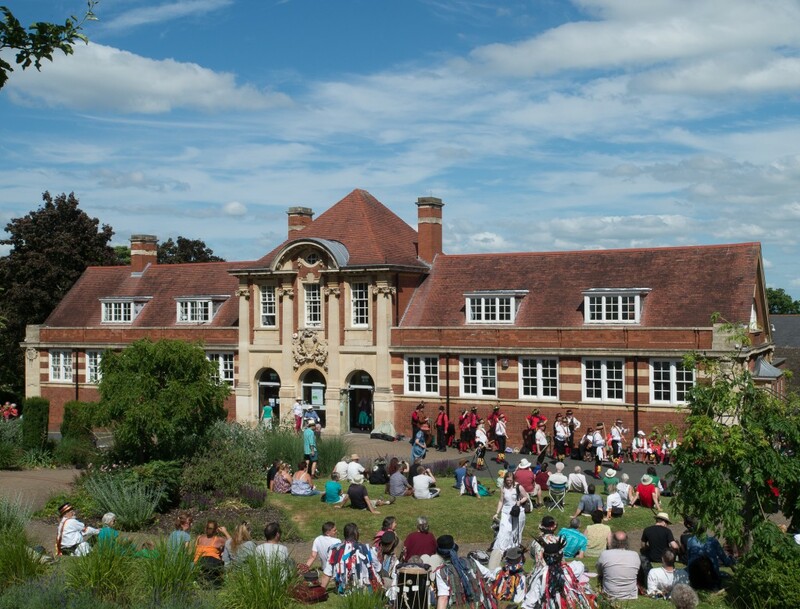 But watching five hours of English country dancing in Malvern, Worcestershire, on July 4, captivated me. My new gallery, English Country Dancing, suggests why. But ‘suggests’ only. For it’s very hard to get good shots of the dancers’ interactions, and of course there’s no soundtrack. The accompanying musicians – playing accordions (I have a new appreciation for them), bass fiddles, clarinets, drums of various types, flutes, soprano saxes, squeeze boxes, tambourines, washboards, whistles – together with sounds and shouts of the dancers and the enthusiasm of the audience and waiting dancers put music I’ve enjoyed for 30 years in a very different perspective. Hearing music often isn’t enough to get it. I have to see it. Since I’m not much interested in dance, the chances I’d see music accompanying it in context were slim. One lyrical encounter with English country dance hasn’t given me anything but a rapturous memory and some snaps I like. No big insights, save one: I understand much better the English folk music I’ve enjoyed for 30 years. So much of the British Folk Revival of the early to mid-60s to early 70s derived from dance music. From the Young Tradition to Steeleye Span in their primes grew today’s exciting new folk revival which you can sample most easily via the wonder-filled www.Folkradio.co.uk and its excellent website, Folk Radio UK. There’s a lot happening, musically, in the UK. I wanted to explain the remarkable number of black-faced dancers in the accompanying gallery. As you’ll see, their costumes don’t suggest 19th century American minstrels or Al Jolson or the ‘Amos ‘n Andy’. But excerpts from what appears to be a fascinating book, City Folk: English Country Dance & the Politics of the Folk in Modern America by Daniel J. Walkowitz (New York: NYU Press, 2013), suggest otherwise. Evidently, American black-face minstrel shows were as popular in the UK as they were in the US from the 1840s through the 1930s. From hence came the make up of black-face country dancers. So argues NYU Professor Walkowitz (at p. 47). Maybe. Nothing I saw in five hours suggested such a connection. Enjoy the snaps. I sure had fun taking them. H/T: Dave Palmater, now of U-Mass Boston’s WUMB, whose much missed weekly program, ‘Folk Tracks’ on MIT’s WMBR, introduced many of us in the 80s and 90s to British folk music in all its glories, aided by his masterful narration and intelligent, cross-linked playlists. A disc jockey whose peers include only the likes of Vin Scelsa. Previous Post Pistol Pete Reiser’s Dings: A Story for Today. Can’t say I have ever fancied the Morris Dancers. Strange lot! You might like John Smith, “Great Lakes”. He is from Devon. Acoustic guitar; big voice, great lyrics. “Perfect Storm” haunts me. Glad you are there, I am in MN. I have a flat in Glasgow in case you are going that way!